This beautiful, energy efficient, one owner home is move-in ready. You&#x2019;ll enjoy the coffered ceilings, crown molding and transom windows. Features include gas log fireplaces in the living and family rooms; two Rinnai tankless water heaters and a Kinetico water softener. Gourmet kitchen has stainless steel appliances: six burner natural gas cooktop; two built in convection ovens; built in microwave oven and newer dishwasher. There Plentiful storage is in the contrasting cabinetry and walk-in pantry and there is lots of counter space. The spacious dining room accommodates a large dining table and hutch. Separate office with French doors is ideal for a home office and formal living room could also be used as a flexible space. Huge master suite has 5- piece bath with double vanities, large shower, jacuzzi tub, and two spacious closets. Guest bedroom features private bath; other two bedrooms share a bathroom. Pergola provides outdoor living space. This beautiful, energy efficient, one owner home is move-in ready. You’ll enjoy the coffered ceilings, crown molding and transom windows. Features include gas log fireplaces in the living and family rooms; two Rinnai tankless water heaters and a Kinetico water softener. Gourmet kitchen has stainless steel appliances: six burner natural gas cooktop; two built in convection ovens; built in microwave oven and newer dishwasher. There Plentiful storage is in the contrasting cabinetry and walk-in pantry and there is lots of counter space. The spacious dining room accommodates a large dining table and hutch. Separate office with French doors is ideal for a home office and formal living room could also be used as a flexible space. Huge master suite has 5- piece bath with double vanities, large shower, jacuzzi tub, and two spacious closets. Guest bedroom features private bath; other two bedrooms share a bathroom. Pergola provides outdoor living space. Please, send me more information on this property: MLS# 369153 – $399,900 – 4004 Lazy Brook Drive, Nolanville, TX 76559. 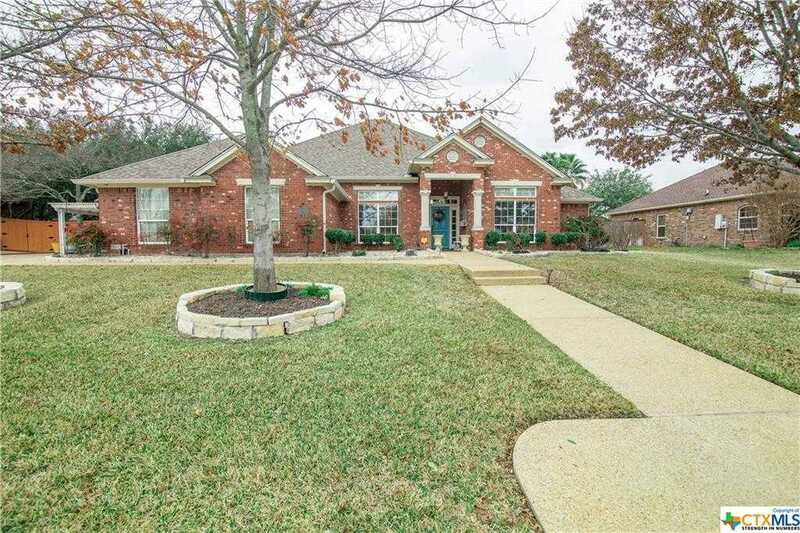 I would like to schedule a showing appointment for this property: MLS# 369153 – $399,900 – 4004 Lazy Brook Drive, Nolanville, TX 76559.